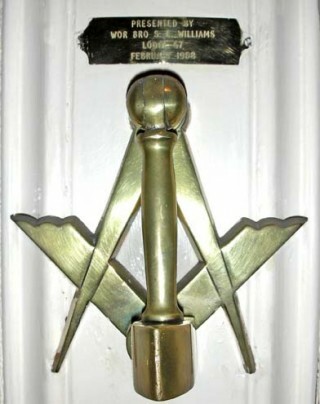 Lodge No. 67 was first warranted in Cork on October 17th, in 1736, and held its first meeting on October 16th of that year. The founding Worshipful Master and Wardens were John Logan, Edward Hartstonge and Richard Burk. Unfortunately there is no record of any other Officers at that time. These two extracts prove the Lodge was definitely suspended. The new Warrant No 67 was issued by M.W. Bro. James, Duke of Abercorn, Grand Master, R.W. Bro. Robert Shekleton J.P., Deputy Grand Master, R.W. Bro. Thomas, Marquess of Headfort, Senior Grand Warden, and R.W. Bro. Lord Arthur Hill M.P., Junior Grand Warden. The date of issue was 4th July, 1884, the signatures appearing for Lodge 67 being Edward Bayley Warburton as Worshipful Master, Senior Warden N. Hutchins and Junior Warden Henry W. Weldon. At the bottom of the warrant and written in red ink in the inscription ‘This warrant was transferred to Cork in 1936’, signed by the Grand Lodge Secretary R.W. Bro. H.C. Shellard. To return to the original request for the warrant of Lodge 995, this was an old military Lodge originally warranted in 1808; its warrant was returned in 1814, but the Lodge continued by a new warrant at Bantry dated 7th July 1814. This warrant was suspended for a while, but the Lodge was definitely working in 1825, and was cancelled by Grand Lodge on January 7th 1830. It was this warrant that the petitioners of 1884 were endeavouring to retrieve. 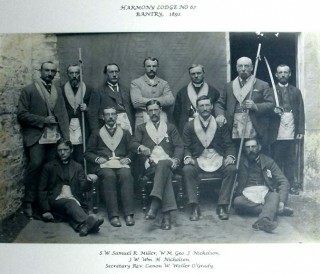 Having looked at the Grand Lodge Register for that period, none of the founders appear to have been connected with the old Lodge 67, which had been suspended in 1876. The founder of Bantry Lodge No. 67 was W. Bro. S.N. Hutchins who entered the Grand Lodge above on 22nd April 1915; it was he who signed as Senior Warden in 1884. The first recorded Entered Apprentices were John Warren Payne, and Rev. William Waller-O’Grady, who received their Degrees on 18th November 1884; thereafter Bro John Payne’s name disappears completely, but W. Bro. Rev. Waller-O’Grady went on to become Provincial Grand Chaplain of Munster, and was also Secretary to the Lodge for 3 years; he died on March 10th 1921. Following a decade of decline after the removal of the naval garrison from Bantry during 1922, the warrant was returned to the Provincial Grand Lodge of Munster in 1932. The Grand Lodge Minutes of 1st October 1936 record that the Grand Lodge board was recommending that warrant No 67 Bantry, which had been held in trust by the Provincial Grand Lodge of Munster, be transferred to Cork. The old warrant of 1736 remains in Freemason’s Hall Dublin. The registry of Members for the year 1936 show the following names N. Birney Snr., M. Wakefield, J. Sayers, G.T. Walker, F.R. Magrath, G. Lepp, J. Watson, M. Sayers, A.M. Sayers, T.G. Butterfield, E. Roe, G. Simms (both from Bantry) W. Levion, R.N. Arthur, and T. Veitch. W. Bro. H. Spinks of Concord Lodge No. 71 was the first Worshipful Master of the re-constituted Lodge 67 Cork, W. Bro. M. Wakefield was Secretary, Bro. C. McBurney was Senior Warden, and Bro. T.G. Butterfield was Junior Warden. 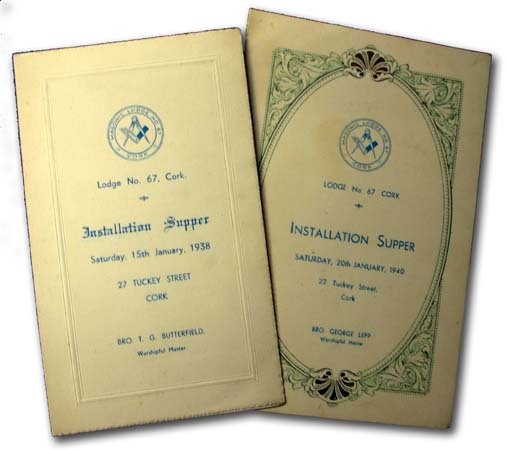 The first meeting was held on October 17th 1936 in the Masonic Hall, 27 Tuckey Street Cork, being the Bi-Centenary of the Lodge’s original warrant. These historical extracts are based upon a paper read in 1986 at the 50th anniversary celebration of the warrant, in the presence the Grand Master, by Bro. James Hogan-Connell who passed to the Grand Lodge Above in 1990. Since the Lodge’s reconstitution in 1936, it was unofficially known as the ‘Travellers Lodge’, due to the large number of Commercial Traveller’s (Company Representatives) who were members and officially known as Harmony Lodge No. 67. From 1936 the initiation fee was £8-8-0 (8 guineas). The Master’s Maul is made of Ivory, and was presented to the Lodge at its foundation by R.W. Bro. H.M. Robertson, Provincial Grand Master of Munster, 19th March 1936. This number was originally issued to CORK, 1 March 1737, where it had a long history of working, despite two suspensions – June to July 1823 and March to August 1872 – before a third suspension of 3 February 1876 led to its being cancelled. The warrant reissued eight years later to BANTRY, Co. Cork, 1 May 1884, where it worked until 1932. On 1 October 1936, having been held in trust, the warrant transferred by permission of Grand Lodge of Ireland to its original location in the city of CORK, under the title ‘Harmony Lodge’, where it continues to this day.